OLYMPIA, Washington, May 15, 2011 (ENS) – Washington Governor Chris Gregoire has signed into law a bill that bans the sale, trade or distribution of shark fins or derivative products in the state. 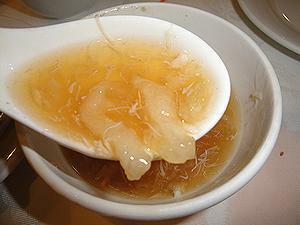 The measure outlaws the sale of shark fin soup, often served as a status symbol in Chinese restaurants. The soup, which can sell for more than $50 a bowl, is a feature of banquets and weddings. Shark cartilage supplements will also disappear from store shelves in Washington. Shark cartilage is claimed to combat and/or prevent a variety of illnesses, including cancer. The benefits of this supplement have not been scientifically proven, nor has shark cartilage been reviewed by the U.S. Food and Drug Administration. State Senator Kevin Ranker, a San Juan Island Democrat who chairs the Natural Resources and Marine Waters Committee, was the bill’s primary sponsor. The measure unanimously passed in the Senate. The House voted 95 to 1 in favor. Conservationists say the law will help to relieve the pressure on dwindling shark populations. Unsustainable fishing methods have led some shark populations to decline by as much as 99 percent in recent decades. More than 73 million sharks are killed every year primarily for their fins, which are often harvested through finning, a practice that involves slicing off the fins and discarding the animal at sea to drown or bleed to death. “By signing this legislation the governor took a very large west coast leadership role in initiating action to address a global problem,” said Whit Sheard, senior advisor and Pacific counsel for Oceana, an international advocacy group based in Washington, DC. “This bill will do two things, help us move closer to ending the wasteful and unnecessary depletion of our ocean’s top predators and serve as a model for Oregon and California as they have similar pending legislation,” said Sheard. Similar laws have been passed in Hawaii, the Northern Mariana Islands and Guam, and are before the legislatures in California and Oregon.